And I’m back… or gone again… or whatever, here’s a blogpost! At Long last, I have returned to you, oh blogging world! So I got home to Ohio and lost the will to write. It isn’t as if nothing happened while I was there, or for the 2 months that I was back at CRO in WV. It’s just that well…. when you’re at home, whether it’s true or not, you feel like nothing’s going on. And as far as CRO goes, the interwebs connections are kinda sparse…. SO.. To Catch you up, here is a Photo summery of what’s been happening in my world. a few days after getting home. These arrived late in the v-day with an anonymously written poem. and they survived nearly 3 weeks! 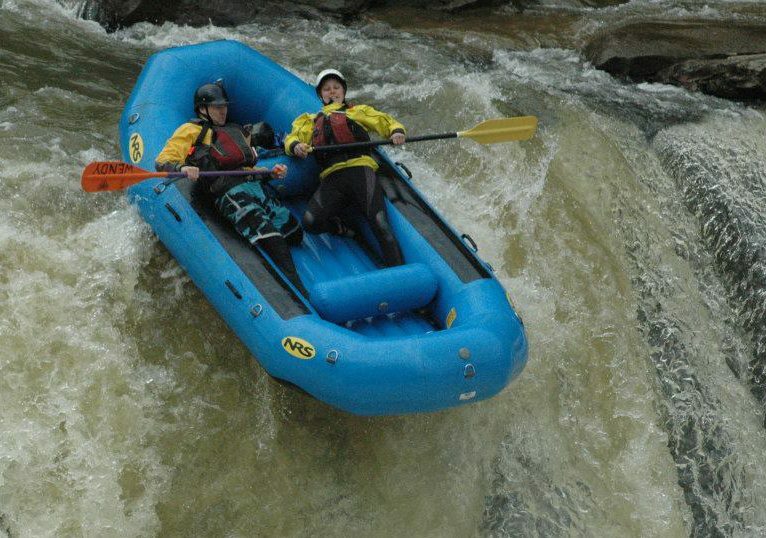 To anyone who says, “There’s no white water in Ohio.” I call BS. This, my friends, is in downtown Cuyohoga Falls, Ohio. for a whitewater rafting industry to flourish. They say it will be class IV. So my man friend and I went to scout what we could in town. I can’t wait to run it! A less painterly view of the beginning of the canyon. The uppermost visible part of the river is one of the dams slated for removal. One of the things I love about West Virginia is how often you are surprised. It’s hard to see, but the workers inside were going about business as though the facade of the building hadn’t been ripped clean off. Sure the dining room was gone, but they’ve still got fries to sell! Little bit o’ preseason repair work in the CRO guide house. Fun with blowtorches in an old wooden house! Very little work to be had…. Lots of playtrips tho! And to take a Rescue3 class, of which I shall become an instructor come fall. I got the opportunity to take an ACA swift water rescue instructor course with Mike Mather, one of the top rescue guys in the industry. Proud to say that I am now a level 3 (soon to be 4) swift water rescue instructor. Mike Mather, our instructor trainer, handing down words of wisdom to Simon. Immediately following the class, The pooch and I had to get in the car and start rolling west for Utah. If you recall, I’m working the Yampa and Green Rivers through Dinosaur National Monument! Anyhoo, I made a quick stop at home to raid the fridge, get a few hugs, and trade out some gear. Back on the Road, first stop, St Louis, to visit my Twin cousin and her hubby and munchkin. Awesome cloud formations to hint at the night of driving I had ahead of me. I drove through one of the most spectacular electrical storms I’ve ever seen! What you don’t see are the 800 or so photos of not lightening that I took and deleted to get these few. So worth killing a camera battery over! just cool. man, Iwill never stop being in awe of thunderstorms. Riley, my goddaughter and budding photographer. Cool looking mushrooms that Riley and I found while wandering around outside trying not to wake her parents. Shelby, catching some night-time air as we drive ever westward, next stop, Denver. The Big Bright Moon shining down on a wind farm. had to pull over to snap this one, long exposure and all… so worthwhile! supposedly the biggest and brightest we’ll see the moon in this lifetime. So It to Denver, after a stop for a short nap… arrived in my friend’s neighborhood about 4:15 am, found a parking spot around 5, by which time, Tim had fallen asleep(and who can blame him?). I sent a text saying where I was parked and to come shake my car when he was ready for breakfast. around 7:30 am, I was curled up on a comfy sofa, Shelby on the floor next to me. I will leave you for tonight with one last shot. Shelby, the turbodog cruising through Colorado, enjoying the view, and anticipating new adventures. Next time (hopefully tomorrow) I will show and tell of my first Yampa trip through Dino NM.